Probably the most talked about film of 1916, “Intolerance” remains a kind of enigma to film historians. Despite the large amount of ink and computer bytes shed writing about it (see the bibliography at the end of this review for a small sample), it seems no better understood than most of the more typical releases of the year. What is this movie that has inspired so much discussion and debate? Is it one of the most important movies in history or just a giant flop? Regular readers of my blog know I usually begin each review with a recap of the action from the film – I don’t worry too much about “spoiling” 100-year-old movies, but if you want to see it first, you can always scroll down to the link and then come back and read the review. In this case, I’m going to be a bit less specific about the sequence of events and just give a summary of the stories, not accounting for the editing or sequence. In part, this is because there are several different movies today calling themselves “Intolerance,” and deciding which is the “most authentic” is one of the sources of debate among scholars. 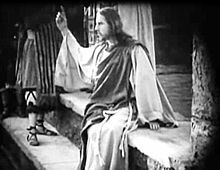 It is complicated by the fact that the director, D.W. Griffith, kept making changes for each new re-release of the movie, beginning shortly after the premier on September 5, 1916. Some have argued that the 1917 re-release is more definitive, or even that the version Griffith reconstructed in 1922 after chopping up the print to release one of the storylines as a separate film is the most accurate. 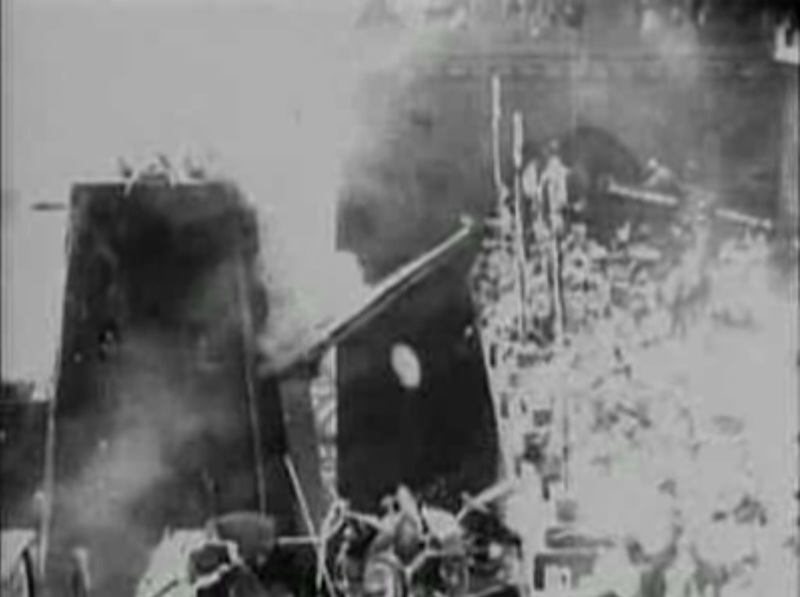 In 1990 the Museum of Modern Art attempted to reconstruct the movie based on the score written by Joseph Carl Breil for the opening night, in an attempt to get back to an “original” form, but it needs to be noted that this reconstruction is highly debated, and that it is possible that most viewers in 1916 were seeing a quite different movie. Apart from that, “Intolerance” has four interwoven storylines, set in different times and places, but with some degree of parallel character and situation. These stories are “The Mother and the Law” (set in contemporary America, from here known as “The Modern Story”), the “Fall of Babylon” (or “The Babylonian Story”), the “Saint Bartholomew’s Day Massacre” (AKA “The French Story”), and the “Judean Story” about the crucifixion of Christ. The four stories are meant to demonstrate how intolerance has worked as the root of evil throughout human history, and the end implies the possibility of a redemption through love and the end of history through universal tolerance. The modern and Babylonian stories are by far the most developed, with the French story dropping in from time to time and the Judean story serving more as an occasional reminder that there are Biblical parallels for things happening in other times. A mother rocking a cradle serves as a transitional image between the stories, but she has no storyline of her own to follow. The Modern Story begins first, introducing a group of “ambitious ladies” who wish to reform society. These reformers are portrayed as the carriers of intolerance in the modern world. They pass judgment on the lives of the poor without understanding that their rich husbands are responsible for creating the conditions of that world. The leader of this pack of bluenosed busy bodies is the spinster sister of a capitalist who exploits his workers in order to make the money to donate to her charities, increasing strife and labor conflict. The results of this are played out in the lives of the “Dear One,” played by Mae Marsh, and her husband “the Boy,” played by Robert Harron, who works at the mill owned by Jenkins, the capitalist. When a strike is called and then crushed by a massacre of workers by armed private security guards and National Guardsmen, the Boy and the Dear One relocate to a city, where they live in poverty and the Boy turns to crime. This results in his being imprisoned and the Dear One’s living conditions being examined by the intolerant reformers, who take her baby away from her. Meanwhile, the head of the criminal gang that had recruited the Boy is trying to come on to the Dear One, to the consternation of the Friendless One (Miriam Cooper), who shoots and kills the criminal boss from outside their window just as the Boy returns from prison, making it look like he did it. Now he is sentenced to hang while the Dear One tries to locate the real killer and clear his name. The Babylonian Story takes place in 539 BC, when Cyrus the Great invaded Babylon from Persia. 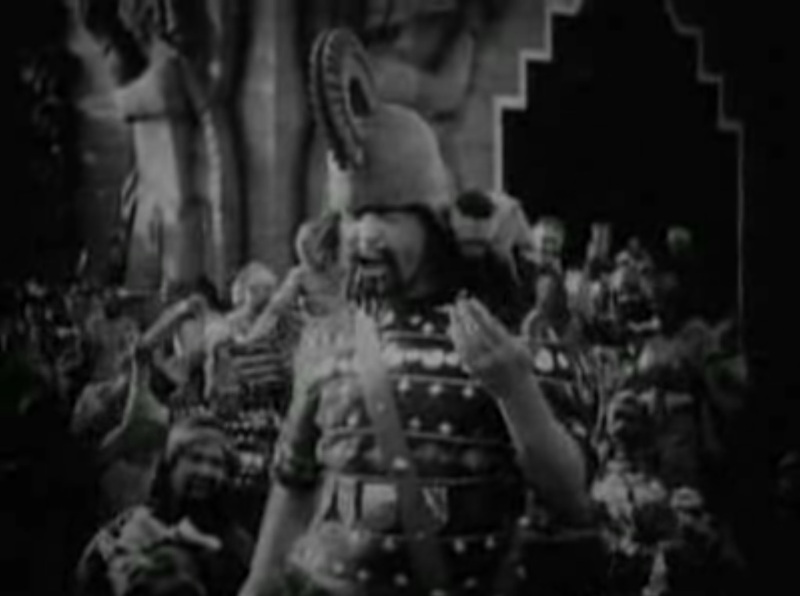 It is shown that the religious tolerance decreed by the king, Belshazzar (played by Alfred Paget), is resented by the high priest of Bel-Marduk (Tully Marshall), and so he conspires with the Persians to defeat the Babylonian forces and invade the city. 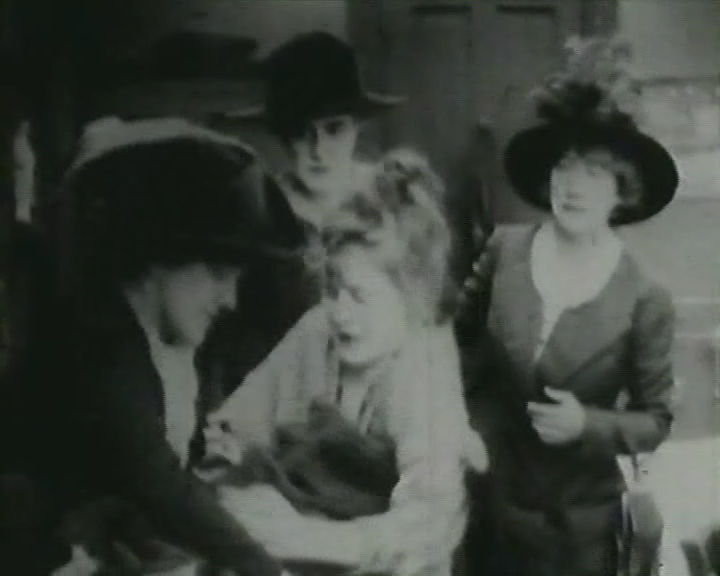 Meanwhile, the Mountain Girl (Constance Talmadge) secretly loves Belshazzar, but he is above her station, so she loyally fights to defend him, ultimately giving her life in the battle. Belshazzar and his Princess Beloved (Seena Owen) commit suicide by poison as the Persians invade and raze the glorious city. The French Story takes place in 1572 and again blames a woman (this time the king’s mother, played by Josephine Crowell) for promoting intolerance of the French Huguenots and instigating a massacre against them. Again, we see this historical event unfold as it impacts the lives of a Protestant family, consisting of “Brown Eyes” (Margery Wilson) and her betrothed, Prosper Latour (played by Eugene Pallette). The Judean Story shows Jesus Christ preventing the stoning of the woman taken in adultery, and how the reaction of the Pharisees to this act of tolerance led to his crucifixion. It also shows the Wedding at Cana, allowing it to parallel sequences of marriages in the other stories, although this is not terribly pertinent to the main thrust of the narrative. Success or Failure? By what standard? I somewhat reluctantly placed this movie into the “Movie Disasters” category of the Classic Movie History Project Blogathon this year. The film is something of a darling of critics and film historians, and while I don’t personally like it that well, I have to admit it has been seen as important and influential. The question of how, and whether, it “bombed” is a somewhat thorny one. Most historians would agree with David A. Cook’s assessment that it was a “commercial failure” in the sense that it cost more money to make than it made back in initial release. William Drew does offer some interesting counter-points to this argument: huge audiences did go to see “Intolerance” in the theaters, and in his narrative it was successful in the USA until the end of World War I and the rise of anti-labor sentiment and the decline of Progressivism, and afterwards it became a hugely popular international hit, particularly in the new Soviet Union, where it influenced Sergei Eisenstein among others. As far as the question of whether it made a profit, Drew cites an early interview with Griffith in which he as much as admits that even if it were a bigger blockbuster than “The Birth of a Nation,” it still could never make back what he spent on it. In other words, it wasn’t designed to make a profit, and therefore shouldn’t be judged as “failing” because it didn’t. To some degree, that argument is a question of “moving the goal posts,” but it does raise the fundamental point of movies as art rather than business, which Silver Screenings wrote about so eloquently on the first day of this blogathon. Many historians have a narrative of D.W. Griffith as the great champion of film-as-art, and in this narrative the “failure” of “Intolerance” is his great vindication. I have some problems with this. First, I’m not convinced that Griffith’s claim to artistry was more than a pose. He was first and foremost a showman, which to my mind is somewhere between businessman and artist: the carnival barker as opposed to the aesthetic genius. Sure, he had some good ideas and he made some good movies (I’d say especially during his Biograph period), but he’s closer to William Castle than Vincent van Gogh. How can I get this monkey off my back? And as a showman he wasn’t a complete failure either. Looking at the ads in trade papers from the time, it is clear that a lot of theaters screened “Intolerance,” and from articles written at the time, it sounds as though the theaters, at least, made money on it from the crowds that came to see the followup to the blockbuster “The Birth of a Nation.” As Russ Meyer would uncouthly put it years later, it all comes down to asses in seats, and Griffith knew how to get those asses in those seats. The next question, much harder to answer, is “what happened when they got there?” There is a general sense from critics and historians that audiences found the four storylines “confusing” and “hard to follow,” suggesting a different kind of failure. Well, I can’t claim to know what audiences of 1916 experienced. I can’t get inside their heads. Certainly media literacy was a newer concept at the time, and it’s possible that some people were confused. I can say that, to me, there’s never any confusion about the storylines. I’ve seen at least two or three different edits of the movie, and I would say that any reasonably intelligent, attentive viewer should be able to process it. But that’s where the problem comes in, really. To watch a silent movie, you have to watch the whole thing with active attention. Any time your mind or eyes drift from the screen, you lose the thread. That’s part of their fascination, I believe, in a world of constant distraction, at least for those of us who enjoy them. Don’t look down – you’ll miss something! But, that is exactly the problem I do have with “Intolerance:” I find it terribly dull and boring. If audiences of 1916 were as bored as I am by it, they may well have lost the thread and come out saying they were “confused” by the stories. The only thing it really has going for it is the monumental Babylon sets and the battle wagons used by the Persians, which are undeniably impressive (especially when you reflect that they were all built for real, unlike a modern spectacle which is all special effects and computer images), but that just isn’t enough to hold a viewer’s interest for 2-3 hours, depending on the version and projection speed. By reducing his most of his characters to symbols (“Brown Eyes,” “The Dear One”), instead of human beings with names, Griffith gives us nothing to hold on to for so long a period, as well as eliminating the possibility of character development or growth. The Dear One is the Dear One, from the first scene to the last, and nothing that happens to her provokes any personal change, just a series of reactions. In less than an hour, I’ve completely stopped caring about her and I’m just hoping for more siege towers burning. Come on! This is what we paid to see! As I say, I don’t know that other people reacted to it the way I do, but it seems possible: a lot of people would be afraid to admit they were bored by the “great D.W. Griffith,” but saying that he went over their heads might seem more acceptable. This is also how the critics for whom Griffith is a hero and a darling would like to describe it. He was just above the level of most people (eve me, I’m sure some will say), not actually a boring filmmaker. The other flaw of the movie, which at least some of the less worshipful historians will admit to, is the heavy-handed didacticism of the Intertitles. Cook quotes Iris Barry as describing it as “an epic sermon,” and it is. Griffith is so determined to get his message across that he hits us over the head with it again and again. Indeed, this is one of the reasons I find it hard to believe anyone has a hard time following it – he tells us repeatedly how old ladies passing judgment on the condition of slums are just like the people stoning the adulteress woman in the bible and therefore just like the evil Priest of Bel-Marduk (however unconvincing that argument may be, you can’t miss it). The content is far less objectionable than the heroic KKK of “The Birth of a Nation,” but his decision to blame most of the evil of intolerance on assertive, sexually unfulfilled women does create a narrative that some will find unfortunate (granting that the Mountain Girl can be seen as a feminist figure, at least), and it really doesn’t help when he waxes pedantic about this. This is still pretty cool, though. As a final comment, I’d like to bust a couple of myths: “Intolerance” was not made as an apology for “The Birth of a Nation,” and it also wasn’t really a defense against the intolerance of those who tried to censor it, either. 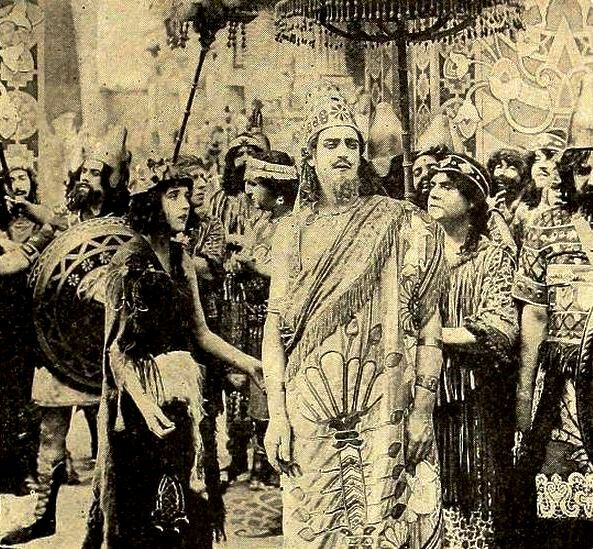 Production on the Modern Story began before “The Birth of a Nation,” and he had been inspired to make the Babylonian Story when he saw “Cabiria” in 1914, so the movie was never really a response or reaction to his 1915 release. It’s possible that, as he went into production on the later parts of the movie, his ideas about intolerance were shaped by his experiences with “Birth,” but that’s as far as you can go with that argument. Starring: Lillian Gish, Mae Marsh, Alfred Paget, Robert Harron, Miriam Cooper, Margery Wilson, Eugene Pallette, Josephine Crowell, Constance Talmadge (two roles), Seena Owen, Tully Marshall, Howard Gaye, Bessie Love, Tom Wilson, Ralph Lewis, Walter Long, Spottiswoode Aitken, W.E. Lawrence, Carl Stockdale, George Siegmann, and a “cast of thousands” – well, it really is rather a lot, anyway. Run Time: Varies, let’s go with 2 Hrs, 50 Min as a reasonable standard, shall we? You can watch it for free: here (no music) or here (with appropriately bombastic score). 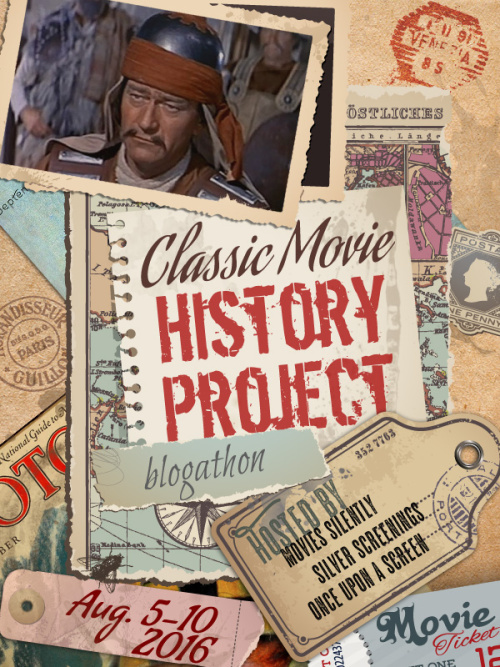 This has been my contribution to the Classic Movie History Project Blogathon. Thanks to Movies Silently, Silver Screenings, and Once Upon a Screen for hosting! Don’t forget to check out the other great posts! Anderson, Gillian B. “D. 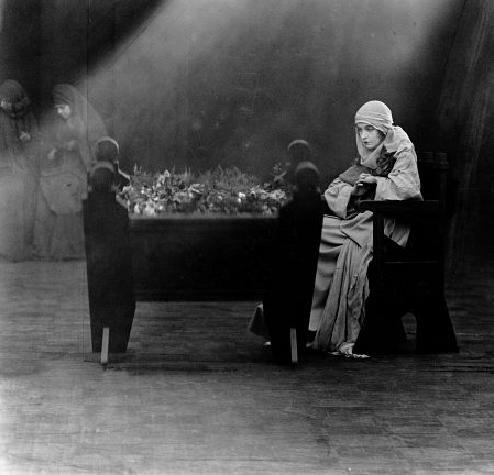 W. Griffith’s Intolerance: Revisiting a Reconstructed Text.” Film History, Sep2013, Vol. 25 Issue 3, p57. Cook, David A. A History of Narrative Film. New York: Norton, 1981. Drew, William. 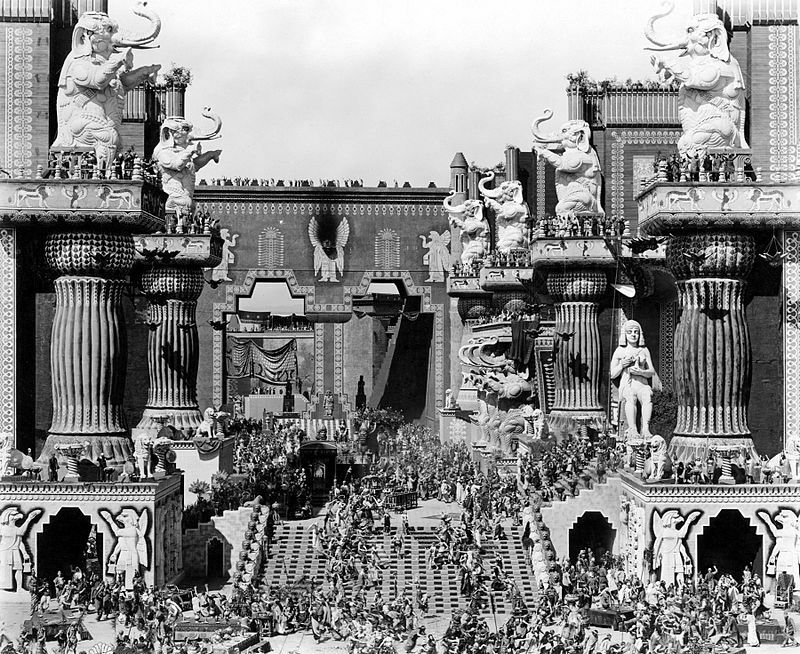 D.W. Griffith’s Intolerance: Its Genesis and Vision. Jefferson, N.C.: McFarland, 1986. Everson, William K. American Silent Film. New York: Oxford University Press, 1978. _____. “Intolerance” (review). Films in Review. Jan/Feb90, Vol. 41 Issue 1/2, p16. 5p. Koszarski, Richard. An Evening’s Entertainment: The Age of the Silent Feature Picture, 1915-1928, vol. 3 of History of American Cinema. Berkeley & Los Angeles: University of California Press, 1990. Leondopoulos, Jordan. “Lost in a climate of opinion: Intolerance revisited.” Literature Film Quarterly. 1990, Vol. 18 Issue 2, p70. 6p. Merritt, Russell. “D. W. Griffith’s INTOLERANCE: Reconstructing an Unattainable Text.” Film History, 1990, Vol. 4 Issue 4, p337. Rogers, Michael. Review of D.W. Griffith’s Intolerance by William Drew. Library Journal. 4/1/2002, Vol. 127 Issue 6, p147. 1/9p. Thomson, David. The Big Screen: The Story of the Movies. New York: Farrar, Straus and Giroux, 2012. Having a good for Intolerance is key, in my opinion–have you seen the Cohen Collection version (the latest one)? It blows the other DVDs out of the water. The picture is so clear, and none other than Carl Davis provides the score–which is magnificent! Ha, and here I just wrote an article about how some folk find Intolerance boring! It doesn’t bore me, but I can see how some people might not care for it. I saw that, and thought about commenting, but it didn’t seem like there was much point in saying “I find it boring, so your opinion must be wrong.” After all, if you don’t, you don’t, and that’s your win. Looks like the last time I watched it all the way through (earlier this year), I saw the 2002 Kino release, so I don’t think I’ve seen the version you mention. I suppose one of these days I’ll bite the bullet and give it a try as well. Oh if you’d seen the Cohen version, you’d definitely know! The quality (both picture and music-wise) is above and beyond the rest. I can’t recommend it enough. I don’t like Intolerance very much, but its theme is surprisingly modern, unfortunately. 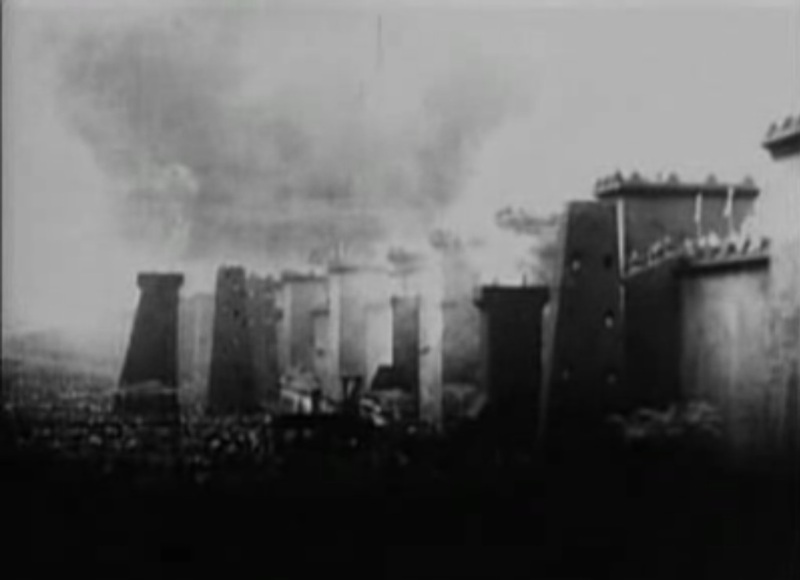 The Babylonian story was my favorite but there was an odd mix of didatics and romantism in those intertitles. And I agree with you that Griffith is “closer to William Castle than Vincent van Gogh”. Thank you for the comment and the link! I really think the film-as-art-or-business debate tends to lose sight of the carnivalesque side of the movies. Intolerance is, if nothing else, a heck of an attraction. Hi Michael. I liked your essay. I agree that Intolerance can be hard to sit through, but the ending with all the stories rushing together always moves me. Even though I have seen it many times, in many versions, as each story ends badly, I still worry about what will happen in the Modern Story. You make me want to pull out the dvd again. I forgot to add: The French Story is boring, but I always find myself thinking two things: 1. What happened to Eugene Pallette in later life that caused his appearance to change so dramatically? 2. What did his voice sound like in 1916? Thanks for the comment! I’m glad if it’s inspired you to take a look. If it works for you, that’s great – obviously a lot of critics and historians have agreed with you over the years. I didn’t realize there were different versions of the film, nor did I realize D.W. himself tinkered with it in the early 1920s. You’ve touched on the fundamental reason I’ve been putting off watching this film: I’m afraid I will be bored to tears. I know people say beautiful things about this film, and I have decided to watch it just for bragging rights, but I was never convinced it needed 3 hours to make its point. 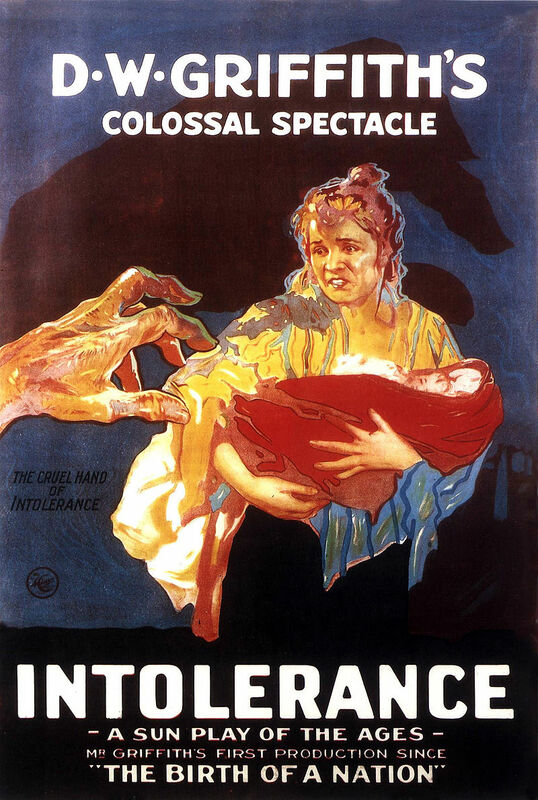 Thanks for joining the blogathon with Intolerance. There’s no way we could have a film history blogathon without including this film. According to some reports, Griffith was an inveterate tinkerer. One time, he had to be barred from the projection room at the Museum of Modern Art, to prevent him from trying to re-cut a preservation copy of one of his films!